An indicator is a substance which changes color in the presence of acids or alkalis. In the laboratory, we use three indicators. These are litmus, phenolphthalein, and methyl orange. Turmeric powder mixed with water is a bright orange-yellow which turns a brick red in the presence of alkali. Indicator can be prepared by boiling, mashing and straining a finely chopped beetroot. Many red or blue colored flowers contain natural dyes which can be used as indicators. The pH scale is a standard scale, which is used for measuring the approximate strength of an acid or an alkali solution. The pH scale has ranged from 1 to 14. Acidic solutions have a pH value less than 7 while alkaline solutions have a pH value greater than 7. Distilled water has pH value 7 and is called neutral substance. Strong acids have pH value 1 or 2 while strong alkali's have pH value 13 or 14. From the pH scale, we can say that higher the hydrogen ion concentration, lower is the pH value and vice versa. An indicator is a substance which changes color in the presence of acids or alkalis. In the laboratory, we use three indicators. These are litmus, phenolphthalein and methyl orange. Many red or blue colored flowers contain natural dyes which can be used as indicators. What are Indicators and how do we use them? An indicator is a chemical substance which has capacity to show the termination of a chemical reaction by changing its colour. Name the types of indicators. The types of indicators are: litmus paper, phenolphthalein, methyl orange and turmeric. Why is an indicator used? An indicator is used to test whether a substance is acid or base. What happens to blue litmus in an acidic medium? Blue litmus turns into red in an acidic medium. What happens to red litmus in a basic medium? Red litmus turns to blue in basic medium. The pH scale is a standard scale, which is used for measuring the approximate strength of an acid or an alkali solution. The pH scale has ranged from 1 to 14. What is turmeric powder mixed with water? Turmeric powder mixed with water is a bright orange-yellow which turns a brick red in the presence of alkali. Write short note on the pH scale. 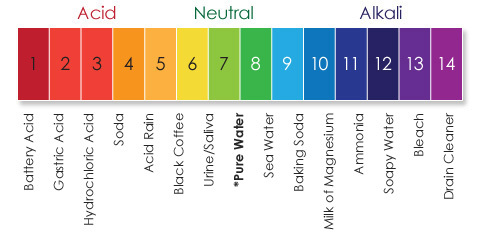 The pH scale is a standard scale, which is used for measuring the approximate strength of an acid or an alkali solution.The pH scale has ranged from 1 to 14. Acidic solutions have a pH value less than 7while alkaline solutions have a pH value greater than 7. Distilled water has pH value 7 and is called neutral substance. Strong acids have pH value 1 or 2 while strong alkali's have pH value 13 or 14. Which of these is not a natural indicator? Blue litmus when gets in contact with acid changes to ______. Red litmus when gets in contact with acid changes to ______. There is no change in color. Blue litmus when gets in contact with base changes to ______. nothing. There is no change in color. Red litmus when gets in contact with base changes to ______. Which one of these is an olfactory indicator? Methyl orange when comes in contact with acid changes to ______. How is indicators different from the ordinary indicator? give the name of more indicators. Any Questions on 'Indicators '?